The Republican-led Congress and President Trump cut taxes on the wealthy last December and federal revenue fell sharply. Oh, wait! That was only what Democrats and the left PREDICTED. What actually happened is federal tax revenue rose. Federal tax revenue for fiscal year 2016—which ended September 30, 2016, right before the November presidential election—was $3.27 trillion, as highlighted by The Balance. FY 2017 (i.e., Oct. 1, 2016-Sept. 30. 2017)—was $3.32 trillion. A slight increase over FY2016. The tax reform legislation passed in December of 2017. Critics claimed the corporate tax cut—from 35 percent to 21 percent—would starve the beast (that is, the federal government). In fact, revenue for FY 2018, which ended in September, was up to $3.34 trillion (estimated). 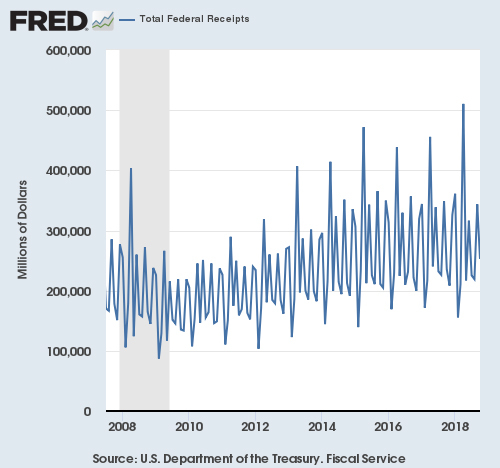 The Office of Management and Budget (OMB) estimates that FY 2019 revenue (which began in October) will rise to $3.42 trillion. As the St. Louis Federal Reserve Bank’s graph shows, there was a significant revenue spike in April. Of course, tax rates aren’t the only factor driving a strong economy and rising tax revenue. Trump has made reducing burdensome regulations a priority. But the economy is also facing headwinds, which may be limiting economic growth, and therefore federal revenue growth. One of those headwinds is Trump’s trade war. It has apparently put a damper on both profits and economic confidence. The Conference Board’s most recent assessment should have people, including the Trump administration, concerned. It’s Index of Leading Economic Indicatorsfor October is +0.1—significantly lower than past months. More troubling, consumer confidence is down by 2.2 points for November and CEO confidence slid 8.0 points for the third quarter. If the president’s trade wars end up dragging down the economy, federal revenue will fall and Democrats will blame the tax reform legislation, which they want to repeal. Let’s hope Trump and President Xi of China can find an acceptable solution soon. The strong economy, tax reform and rising federal revenue may depend on it.